It’s that time of year again. Time to bust out the coat, scarves and gloves, turn the central heating on, curl up into a ball and eat warm comforting food. I love this time of year. It makes me feel homely. A time to use hearty, comforting recipes to metaphorically wrap up warm in. With an arsenal of seasonal vegetables acting as the coat, hat scarf and gloves, time to get as snug as a bug in a rug. Apples, pears, beetroot, turnips, carrots, butternut squash, pumpkin, oh my! The list goes on. I have recently moved from my native land to Istanbul, a last minute move that saw us packing up our life within a week and flying out to this most interesting of places. The food here is amazing and deserving of a dedicated post, it is hard to resist the temptation to eat out daily when it is so damn cheap. A carnivores dream. Eating in has been another matter entirely. Our new home lacks my weapon of choice, the oven. I have had to adjust to cooking everything we eat on the hob, getting creative to avoid culinary boredom. Disheartened, my blog has been neglected because of this, even though I have to say, I have been doing more than making do, coming up with some rather good dishes. And I do say so myself. The weekly shop has been a challenge. Converting the exchange rate in my head to work out what is value for money (I have always been a thrifty shopper), working with the ingredients that they have and those that they don’t has been a challenge. In the UK our diverse culture is reflected in our food and our supermarkets, you can pretty much get anything you could possibly dream of from all corners of the globe. I have found shopping here pretty limited compared with what I am used to, but perhaps it is just me mentally limiting myself, looking for the familiar and coming back with chicken. Every time. The fresh produce on the other hand, is wonderful and reasonably priced. You can guess my elation to find a healthy amount of peeled, chopped and pre-prepared pumpkin for just under one pound sterling. A steal. 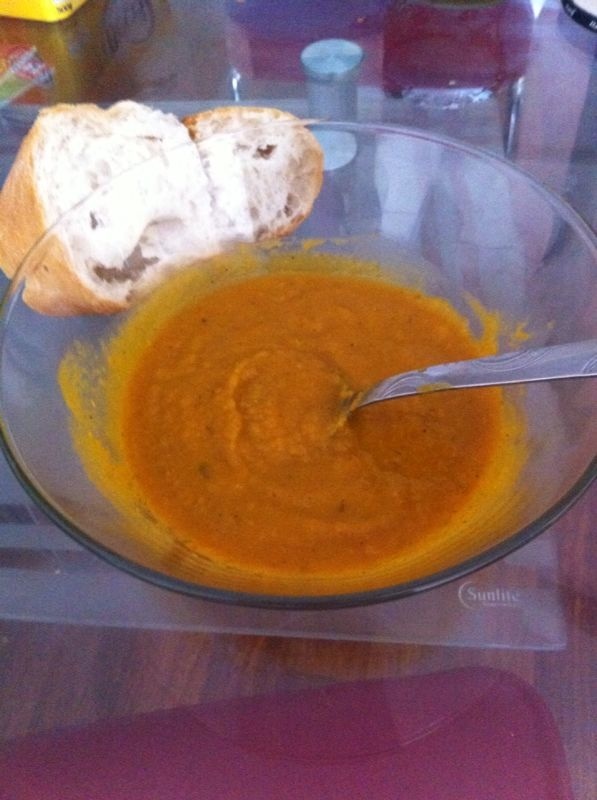 I am ashamed to say before this I had never tried pumpkin, or at least not in my adult life, so this soup was made according to my usual formula for butternut squash soup, lots of nice spices to balance the sweet flavour of the squash. Usually I would roast the pumpkin in the oven with olive oil and two gloves of garlic (in its skin) and would recommend this for those endowed with an oven. Nothing beats the taste of sweet, oven roasted garlic. As with all things like this I didn’t use precise measurements for the spices. I just throw in and alter and taste as I go. I have given approximate measurements, tweak as necessary. Boiling Water (enough to cover and to add later according to the desired thickness). Melt the butter in the pan. Add the onions and cook on a lowish heat until the onions are translucent and emitting lovely smells. Add garlic and cook for a couple of minutes. Add pumpkin, water, stock cube and spices. Let it bubble, turn down to a medium heat and cover. Cook for around 20mins or until the pumpkin is tender. Blend. Taste. Add more spices if necessary (I kept it on the heat and covered for another 5 mins to incorporate my preference for this soup is to have ginger as the predominating spice). Enjoy with crusty bread. Soup is a great way to ingest goodness, pumpkin with its beta-carotene (an important anti-oxidant that is converted to Vitamin A in the body), vitamin B, vitamin C and calcium to name but a few is no exception.